내용주기 The effects of early retirement on youth unemployment: the case of Belgium / Alain Jousten, Mathieu Lefe？bvre, Sergio Perelman and Pierre Pestieau -- The interaction of youth and elderly labor markets in Canada / Michael Baker, Jonathan Gruber, and Kevin Milligan -- Social security, retirement and employment of the young in Denmark / Paul Bingley, Nabanita Datta Gupta, and Peder J. Pedersen -- Labor force participation by the elderly and employment of the young: the case of France / Melika ben Salem, Didier Blanchet, Antoine Bozio and Muriel Roger -- Early retirement and employment of the young in Germany / Axel Bo？rsch-Supan and Reinhold Schnabel -- Youth unemployment and retirement of the elderly: the case of Italy / Agar Brugiavini and Franco Peracchi -- Does social security induce withdrawal of the old from the labor force and create jobs for the young? : the case of Japan / Takashi Oshio, Satoshi Shimizutani and Akiko Sato Oishi -- Early retirement and employment of the young in the Netherlands / Arie Kapteyn, Klaas de Vos, and Adriaan Kalwij -- Social security incentives, exit from the workforce and entry of the young / Michele Boldrin, Pilar Garci？a-Go？mez, and Sergi Jime？nez-Marti？n -- Incentives to retire, employment of old and the employment of the young in Sweden / Ma？rten Palme and Ingemar Svensson -- Releasing jobs for the young? : early retirement and youth unemployment in the United Kingdom / James Banks, Richard Blundell, Antoine Bozio and Carl Emmerson -- Do elderly workers substitute for younger workers in the U.S.? / Jonathan Gruber and Kevin Milligan. 키워드 Social security. Old age pensions. Older peopl--Employment. Youth--Employment. Labor supply. Retirement--Government policy. Early retirement incentives. Many countries have social security systems that are currently financially unsustainable. Economists and policy makers have long studied this problem and identified two key causes. First, as declining birth rates raise the share of older persons in the population, the ratio of retirees to benefits-paying employees increases. Second, as falling mortality rates increase lifespans, retirees receive benefits for longer than in the past. Further exacerbating the situation, the provisions of social security programs often provide strong incentives to leave the labor force. Social Security Programs and Retirement around the Worldoffers comparative analysis from twelve countries and examines the issue of age in the labor force. A notable group of contributors analyzes the relationship between incentives to retire and the proportion of older persons in the workforce, the effects that reforming social security would have on the employment rates of older workers, and how extending labor force participation will affect program costs. 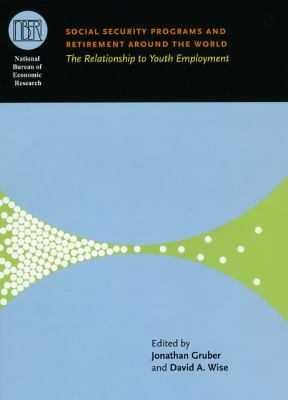 Dispelling the myth that employing older workers takes jobs away from the young, this timely volume challenges a raft of existing assumptions about the relationship between old and young people in the workforce.